When most people think of games on Nintendo’s platforms, they tend to think of cutesy and family-friendly characters and games. Well, Mario, Kirby, and Pikachu better get ready to have their socks scared off because indie horror phenom Outlast just landed on the Nintendo Switch. The arrival of the incredibly scary first-person / camcorder title was a bit of a surprise. The first news came to most once gamers began to see the title on the Nintendo Switch eshop. The release of the title on the Switch comes in the Terror Bundle. This features both the original game and its prequel add-on titled Whistleblower. 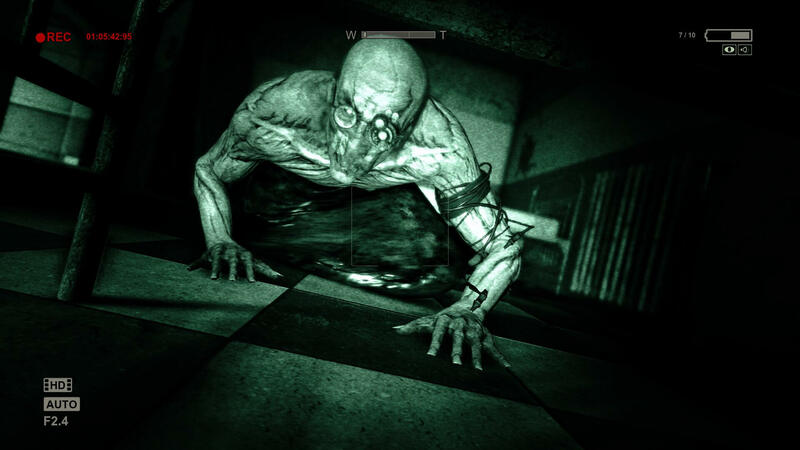 Outlast can be picked up for $24.99 right now and its sequel, Outlast II can now be pre-ordered for Switch according to the launch trailer released by developer Red Barrels. Outlast follows the story of a journalist by the name of Miles Upshur. Upshur is investigating some bizarre happenings at an insane asylum. The most frightening part of the gameplay is the Upshur is essentially defenseless and has to play a cat and mouse stealth game with the inmates. Much of the asylum is also poorly lit so Upshur must use the night vision function of his camcorder to see in his environment. Batteries become as good as gold with the camcorder literally becoming your only beacon of light.